By November of 2018, the Federal Reserve had raised interest rates twice. That means that savings account interest rates are also going up. So, it might be a good idea to shop around for the best deal on a savings account, both at your own bank and at other institutions. Here are six tips for finding a savings account that will give you an interest rate hike. Credit unions have the same federal insurance and protections for your money as banks do, but often have better terms on checking accounts and higher interest rates on savings accounts. Local banks are also worth checking out because they can have higher interest rates than the big national chains. Banks that don’t have physical locations can often pay higher interest rates because they have lower overhead. However, this can leave people wondering whether or not these online banks are secure. The answer is that they are just as secure as a brick-and-mortar bank. The accounts are still insured by the FDIC for up to $250,000 per depositor, and some of them are owned by big players in financial services like Discover and American Express. Sometimes banks will offer you a high rate or bonus cash to bring you over, but then decrease the rates after a short period of time, which is known as a teaser rate. Banks, of course, are within their rights to change the rates at any time, but teaser rates are specifically set to expire quickly. The key here is to make sure you read the fine print so that you are getting good interest in the long run. Certificates of deposit can be a good savings vehicle and if you shop around you can often get good rates. But sometimes savings account rates are just as good or even better. In an environment where rates are on the rise, you may not want to lock up your money into CDs for three or five years. It doesn’t matter how good the interest rate is if you’re constantly getting whacked with maintenance fees or low balance fees. Some banks allow you to keep your money without fees and have small deposits, while others require $10,000 or more for the best rates. Make sure you understand what fees your bank charges and how much you need to keep in the account to get the rate you want. Most people like to spend whatever money is in front of them. There are a few exceptions to this rule, such as people who are super savers, but that doesn’t apply to the bulk of us. 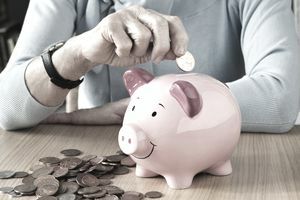 It’s a good idea to make savings as automatic as possible so that you can earn interest on as much money as possible without having to think about it. There are several ways to do this, but two keys ways are completely mindless, which is good because if you’re not thinking about it, it’s easier to save. The first way is to have an automatic deduction taken out of your checking account and put into your savings account every time you get paid. You can make this deduction for any amount of money you want. It doesn’t matter if it’s $5 or $500. The important thing is that you make the transfer automatically so that you don’t have to think about it. The second way, and this is not offered at all banks, is to have your bank put the “round up” change from every debit transaction directly into your savings account. For example, if you buy gas for $21.63, then your bank would charge your checking account $22 and put the additional $.37 in your savings account. This doesn’t sound like a lot of money, but it can really add up quickly. And like the first method, it’s completely painless. One of the best things about getting the best interest rate possible in your savings account is that interest earned is as close to free money as you can get. And in a savings account, if it’s under the FDIC limit it’s as safe as you can get as well.